USGBC-Illinois has partnered with Prairie Lab, LLC, to offer our members discounted registration for Chicago Biomimicry Immersion. Visit prairielab.com/immersion to learn more and register. Be sure to enter promo code USGBC10 to receive 10% off the cost of registration! What if we could (re)design our buildings, communities, and cities to not only LOOK but ACT more like the natural environments they inhabit; making them more sustainable and resilient as a result? Immerse yourself in the biomimicry design methodology and begin to translate nature’s deep principles of sustainability and resilience into the language of design. Combining internationally recognized biomimicry DesignLens methodology with our own local outdoor ecological experiences; architects, designers, engineers, students, and other enthusiasts will learn to create innovative, resilient, and restorative design solutions that are rooted in a unique sense of place. Apply what you learn directly to your LEED and Living Building Challenge projects! The Chicago Biomimicry Immersion is offered on one Saturday during the months of April, June, August, and October of 2015: four different seasons, four unique experiences. Each module includes admission to the award-winning Morton Arboretum and four hours of indoor and outdoor professional development. Participants also have the option to complete an independent assignment mentored by the instructor to extend their learning and apply it to their work. Earn up to 32 LU/HSW units within 6-months, and apply what you learn to projects at your firm! 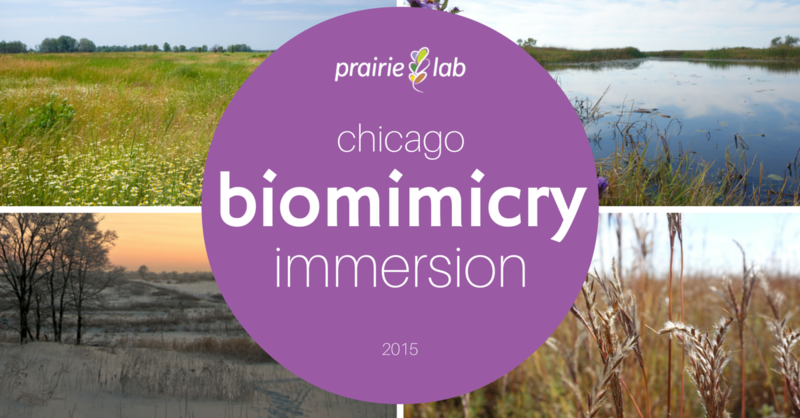 USGBC-Illinois has partnered with Prairie Lab, LLC, to offer our members discounted registration for this year’s Biomimicry Immersion.